Configuration: 24 boxes per master case. 12 boxes per inner case. 12 packs per box. 8 cards per pack. 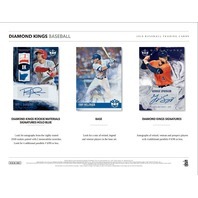 - Find the first autographed memorabilia cards of the 2018 rookie class in Diamond Kings Rookie Material Signatures! - This year will feature more variations than ever before in sets like black-and-white, name, photo and sepia! 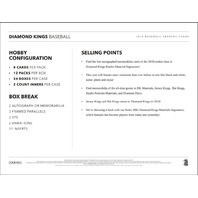 - Find memorabilia of the all-time greats in DK Materials, Jersey Kings, Bat Kings, Studio Portraits Materials, and Diamond Deco. 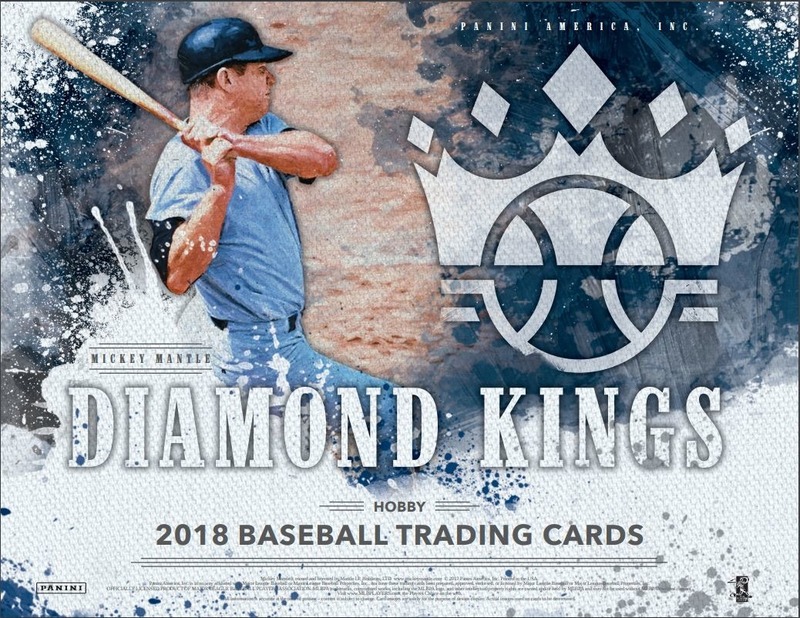 - Jersey Kings and Bat Kings return to Diamond Kings in 2018! 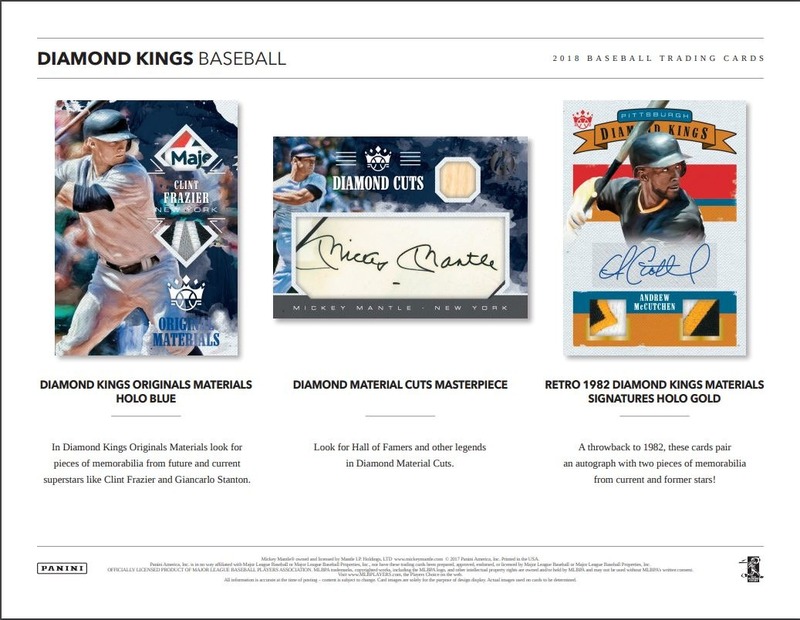 - We're throwing it back with our Retro 1982 Diamond Kings Materials Signatures, which features fan-favorite players from today and yesterday! 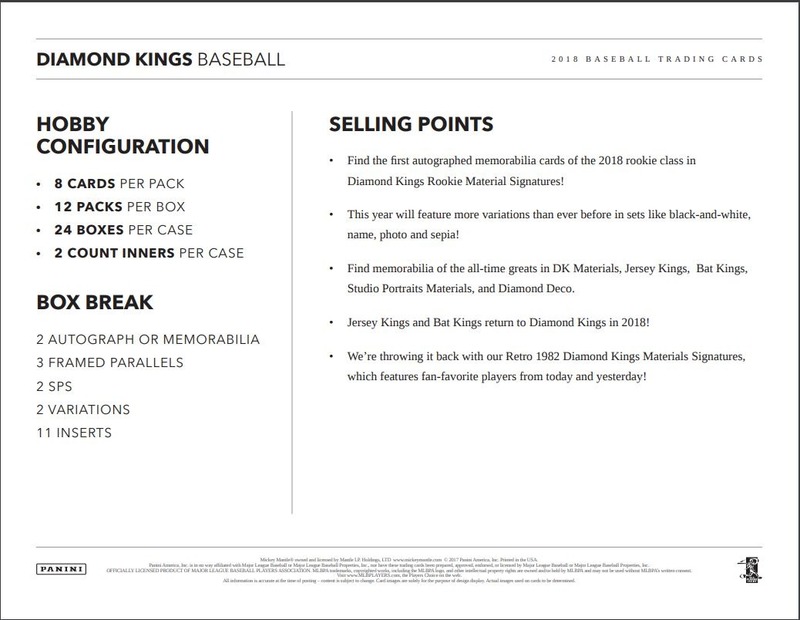 Look for a mix of retired, legend and veteran players in the base set. 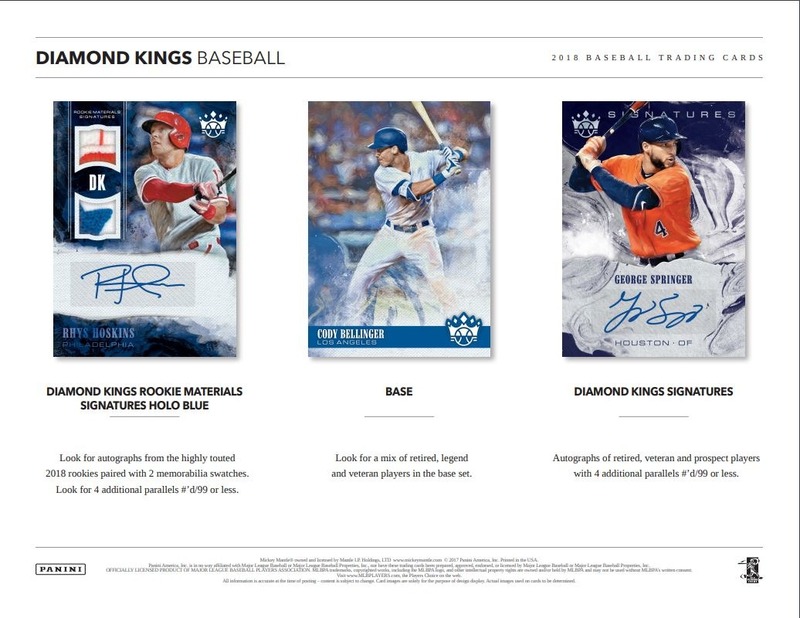 Look for autographs from the highly touted 2018 rookies paired with 2 memorabilia swatches. Look for 4 additional parallels #'d/99 or less. Autographs of retired, veteran and prospect players with 4 additional parallels #'d/99 or less. 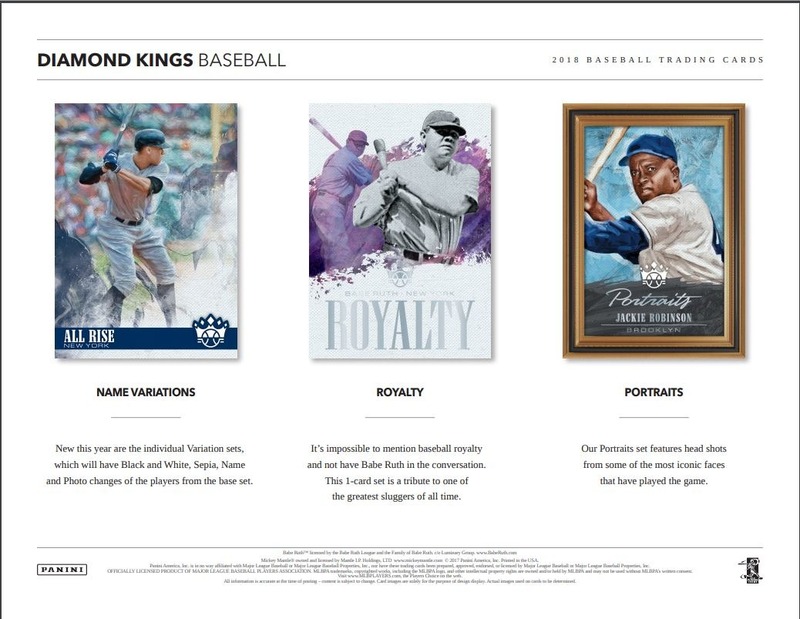 New this year are the individual Variation sets, which will have Black and White, Sepia, Name and Photo changes of the players from the base set. It's impossible to mention baseball royalty and not have Babe Ruth in the conversation. 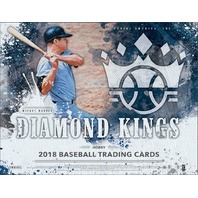 This 1-card set is a tribute to one of the greatest sluggers of all time. Our Portraits set features head shots from some of the most iconic faces that have played the game. 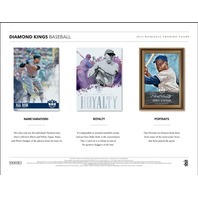 In Diamond Kings Originals Materials look for pieces of memorabilia from future and current superstars like Clint Frazier and Giancarlo Stanton. 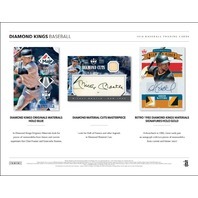 Look for Hall of Famers and other legends in Diamond Material Cuts. A throwback to 1982, these cards pair an autograph with two pieces of memorabilia from current and former stars!